A Worcestershire MP wants every new school in England to be provided with a "proper" kitchen in a bid to improve the quality of school meals. Michael Foster says he is responding to parents' concerns about the issue. The Labour MP for Worcester says he has also asked for the plans for Redhill Primary School to be altered. A TV campaign by celebrity chef Jamie Oliver has highlighted the standard of school food, with Prime Minister Tony Blair now promising government action. Mr Foster has written to Worcestershire County Council asking that improved kitchen facilities be provided whenever a new school is built in the region. Specifically, he said he had examined the plans for Redhill primary, which is to be rebuilt later in the year, and asked the local education authority to amend them. "The parents who spoke to me at the school gate were right to be concerned about the size of the school kitchen planned for the new building," Mr Foster said. "It is important that this is sorted out now before building work starts on this exciting project." Mr Foster added: "I don't expect children to switch immediately to healthy eating, but Jamie Oliver has shown good food can be served up in an attractive way, and children will eat it. "The challenge is to make this the norm in all our schools." Mr Foster told BBC News he would have taken the same action regardless of Jamie Oliver's campaign and that parents had approached him about school food before the series began. Writing in the Observer on Sunday, Tony Blair acknowledged anger expressed over the diets on offer at many schools. 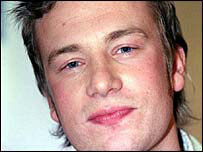 He promised to set up a School Food Trust to build on the work in the Channel 4 series, Jamie's School Dinners. A Conservative spokesman said the plans for school meals "seem good but are probably all a gimmick". The Tories would be publishing their own proposals "shortly", he added.